Cristiano Ronaldo has retained his FIFA men's player of the year award after scoring 44 goals in 48 appearances in 2017, including 33 for Real Madrid and 11 for Portugal. The forward collected his award at a ceremony held at the London Palladium last night, with fellow nominees Lionel Messi and Neymar both in the crowd. 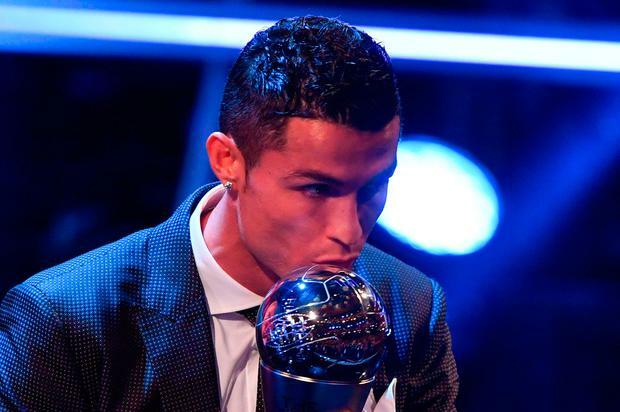 "Thank you a lot to the guys for voting for me," Ronaldo (pictured) said. "(I want) to give a mention to Leo and Neymar to be here, Real Madrid supporters, my team-mates, my coach, my president - they support me all the year so I have to say thank you to them. Arsenal striker Olivier Giroud won the FIFA Puskas Award for best goal after his stunning 'scorpion-kick' against Crystal Palace in January. Chelsea manager Antonio Conte was shortlisted for men's coach of the year but the Italian, who lifted the Premier League title in his first season in England, lost out to Zinedine Zidane. Zidane became the first coach to win back-to-back Champions League titles as Madrid beat Juventus in the final in May. He also led Los Blancos to their first league title in five years. Juventus boss Massimiliano Allegri was also shortlisted. The Italian club boasted their own winner in London, however, as their goalkeeper Gianluigi Buffon won the best goalkeeper prize. The 39-year-old guided Juve to a sixth consecutive Serie A title and managed 600 Champions League minutes without conceding a goal. "I am very happy, for me it is a great honour to receive this award at my age," Buffon said. There was not one English player named in the FifPro World XI, nor even one from the Premier League. Buffon was the goalkeeper selected while Paris St Germain's Dani Alves and AC Milan's Leonardo Bonucci were picked in defence, along with Madrid pair Sergio Ramos and Marcelo. Madrid's Luka Modric and Toni Kroos were included in midfield, together with Barcelona playmaker Andres Iniesta. The three nominees for the Men's Player Award - Ronaldo, Messi and Neymar - took the three attacking spots. Celtic supporters won the Fan Award, recognising their celebrations in May for the 50th anniversary of the club winning the European Cup. Fans at Celtic Park held up coloured cards that spelled out 'Lisbon Lions' in tribute to Celtic's 1967 triumph over Inter Milan in the Portuguese capital. Celtic chairman Ian Bankier said: "This is an incredible honour. I want to thank FIFA and all the fans who voted for us. "The display that was at the centre of that award was for a team of players that all grew up within a few miles of Celtic Football Club in Glasgow. "They were coached by a man who was a legend, born in the east of Scotland, who started his career going down mines for coal. He said, 'a club is nothing without his fans'." Lieke Martens won the women's player award after inspiring Holland to victory on home soil at Euro 2017. The Barcelona forward came out in front of fellow nominees Carli Lloyd, who collected the award last year, and Deyna Castellanos. The women's coach category was won by Holland boss Sarina Wiegman, who led the Dutch national team to the Euro 2017 title on home soil, while the Fair Play Award went to Francis Kone. Kone saved the life of goalkeeper Martin Berkovec, who almost suffocated by swallowing his tongue during a Czech league match in February.